Our comprehensive line of steel tank products has been used in countless applications from agricultural petroleum fuel storage to methanol storage in natural gas separator packages. 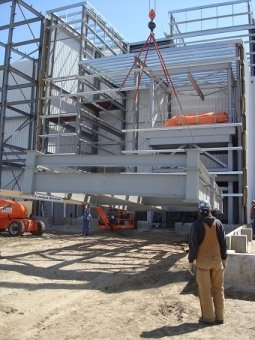 We offer ULC S601-07 tanks in all sizes and API 12F modified tanks up to 1000 bbl. 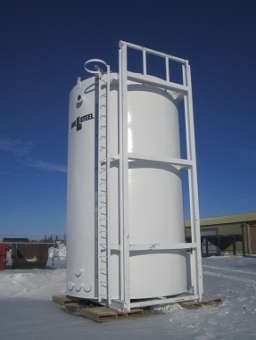 We also carry Transport Canada IBC slip tanks in all sizes up to 1000 gallons. NEW: Our Toronto Ontario sales office is now open. Serving Ontario. 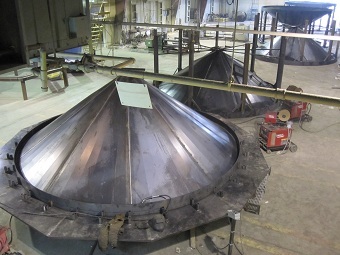 Huge L Steel is a manufacturing company specializing in steel tanks, grain hoppers and custom steel fabrication. 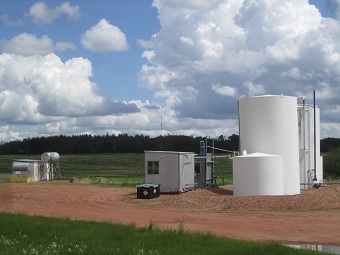 Our comprehensive line of steel tank products has been used in countless applications, such as: agricultural and marine fuel storage, methanol storage for natural gas separator packages, above-ground fuel storage for gas stations, frac drilling, aviation and helicopter fueling, oil production storage, large bulk petroleum storage, and mobile fuel storage for generator packages. Barrel tanks: we manufacture 100, 200, 400, 750 and 1000 bbl tanks that can be blasted, painted, insulated and lined; or we can sell them bare. Our 'standard' grain bin hopper cones are currently available in 14', 15', 18', and 19' diameter sizes. We also now have our new 21' hoppers ready for market. 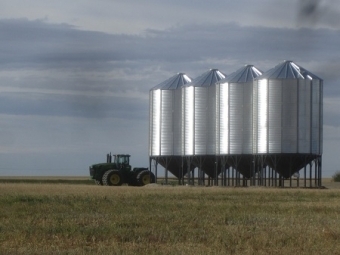 All hoppers have been designed to fit with major grain bin manufacturers' designs. Each cone is manufactured to the high quality standards expected from the Huge L Steel brand. 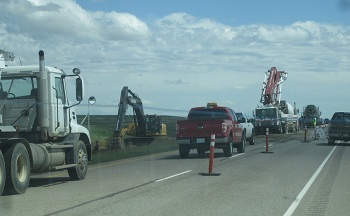 The cones are ruggedly built to provide maximum support, capacity and stability. As options, we can apply internal paint and/or install aeration (both tube/rail and V shape designs). As part of our custom fabrication product offering, we can supply OEM's (Original Equipment Manufacturers) with part manufacturing and assembly. We also provide complete product assemblies and sub component assemblies to those companies in the agricultural manufacturing industy. If you are an OEM manufacturer requiring assistance with your delivery timelines and need a welding shop that can meet your requirements for superior quality, give us a call. Steel products, welding and engineering: it's our specialty. The Huge L Steel Inc. sales office is now situated in downtown Toronto Ontario. We offer a wide range of tank products using manufacturing partnerships. We provide full engineering and design of tank installations. At Huge L Steel, we are enthusiastic innovators. Innovation is a key element of progress. And progress is all about taking past advancements and achievements and building on them in order to make new ideas a reality. Overall, it's a belief in embracing change and advancement through innovation in all areas: new products, processes, refinement and technology. This philosophy, along with our commitment to customer satsifaction, drives everything we do. With every job we complete, we strive for ways to innovate and improve. Huge L Steel is evolving in all aspects of our operations due to our NEXT LEVEL® initiative. We endeavour to ensure that working with us is an efficient, value-added process, and that our products are exceptionally well-made and delivered on-time. We are committed to continuing to streamline our processes, improve our products and to offer our customers our best-ever service. Working with Huge L Steel, you can be certain that we will always be improving and adding value to our products. Oct/12: As part of our mission to continuously improve our products, we have introduced two new design changes to our small mobile tanks. 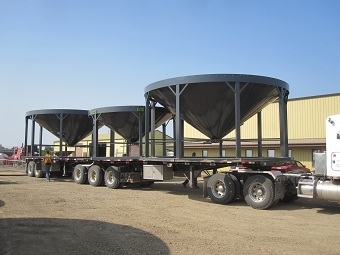 When you need large barrel tanks, such as 400, 750 and 1000 bbl's, we can deliver quickly. Book now for your next years requirements.